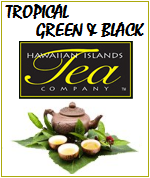 Hawaiian Tradition Coffee - 10 % Kona Coffee blends - Light City Morning Roast, Dark French roast & Vanilla Macadamia nut, Chocolate Macadamia nut tropical flavored blends. 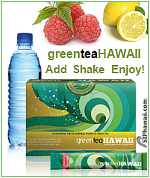 100% Kona Looking for a particular flavor or brand? 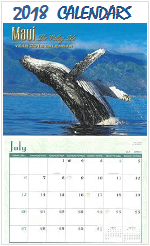 Check out our Coffee All Islands page. 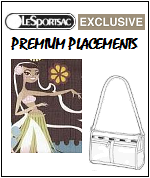 than some offers including free shipping. 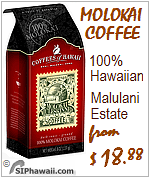 12 pack of 7oz Hawaiian Tradition Coffee only $14.95. 2-5 bus. days. PO Box, APO/FPO/DPO. Light City roast / American roast / Morning Roast and Dark French Roast, Vanilla and Chocolate Macadamia. Hawaiian Tradition coffee. Each cup of Hawaiian Tradition coffee is enveloped in the in the exquisite flavors that only Hawai'i's unique temperate climate and volcanic soil can provide. the only coffee growing state in the United States. Islands where the sun is warm, the breeze fragrant, and where every cup of coffee brightens your soul and stirs your senses. 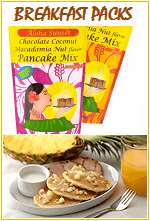 The Hawaiian Tradition coffee packs are decorated with the Hawaiian state flower, the Hibiscus. 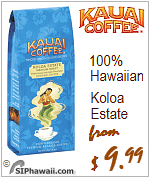 When using Hawaiian Tradition Gourmet Coffee, the most important element of a great cup of coffee is the water. If your water is high in mineral content or impurities, a good choice is to switch to a quality bottled water. To brew use a French Press or high-grade drip coffee maker. 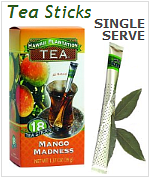 For peak flavor add one tablespoon of ground coffee for every six ounces of cool water. 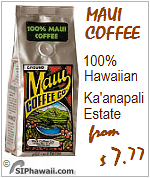 Consume your Hawaiian Tradition coffee immediately after brewing. 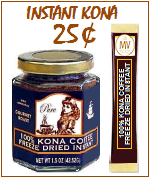 Enjoy the inviting aroma of Hawaiian Tradition Gourmet coffee packed for Longs / CVS Freshly roasted and shipped from Hawaii. 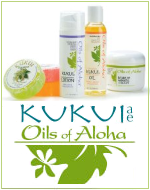 exquisite flavors that only Hawai'i's unique temperate climate and volcanic soil can provide. making Hawaii the only coffee growing state in the United States. 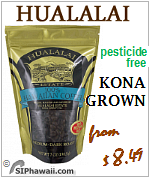 Hawaiian Kona coffee beans are grown on the Big Island of Hawaii. 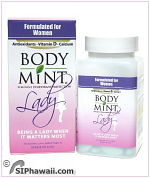 These coffee beans are treasured for their flavor and aroma. 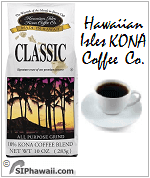 Kona coffee beans are some of the most valuable on the market and are known as the best for their smooth taste. For over 170 years, Kona coffee beans have been cultivated on a small volcanic area of about 2 x 20 miles around the district of Kona. 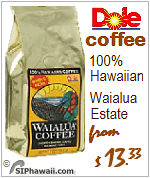 The sloping hills of two volcanic mountains, Mauna Loa and Mauna Kea, protect the coffee trees from the trade winds. gentle afternoon summer rains naturally irrigate the beans as they mature. summer the Konacoffee beans mature.